King's College and Marischal College both have mid-seventeenth century ceremonial maces. 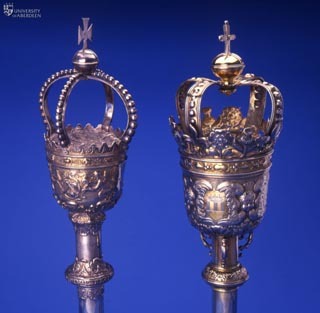 While the silver-gilt mace of Marischal College (on the right) is probably one of a number made in London in the early 1660s to replace those that had been destroyed during the previous decade, that of King's College (on the left) is much more significant. It was made in 1650 by the Aberdeen silversmith Walter Melville for the visit of Charles II. 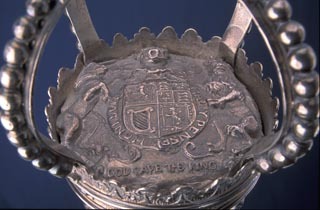 The heraldic message of the College's loyalty to the Crown is emphasised by the motto "God Save the King".